Halloween is in seven days. Are you ready? Since I haven’t finished unpacking yet, and my new home is nothing like my old home, I’m constantly tweaking my holiday decorations. They just don’t seem to fit the new house. I added my easy bat aviary earlier in the week, but it wasn’t enough. I needed more Halloween printables! The frame is actually a block of wood with an image decoupaged on the front. I thought of using blue tack (the kind teachers use on their walls) to stick on my Halloween printable, but I was afraid it would leave an oily residue. It’s not supposed to, but I didn’t want to risk it. I saw my baker’s twine in a drawer, and knew that might be just the cute touch I needed. 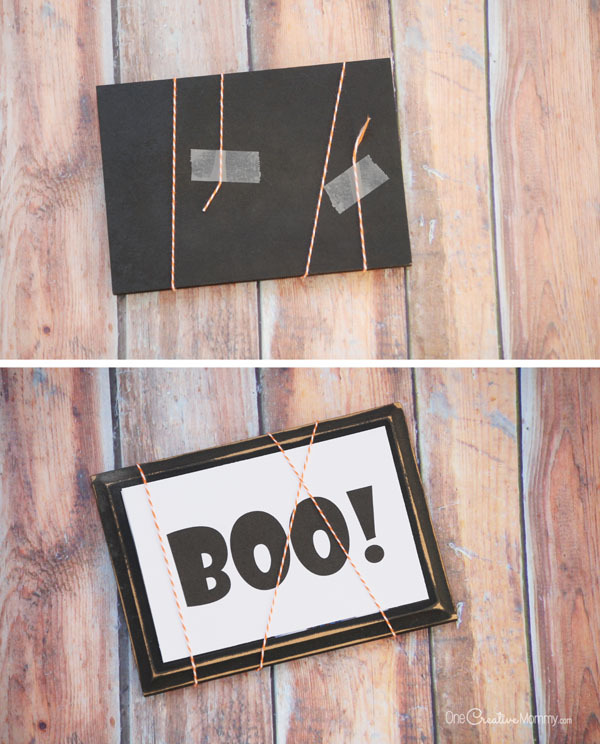 All I did was cut a long piece of string, tape one end to the back, wrap it tightly around my “Boo!” image several times, and then tape it again. If you do this, make sure to pull the string tight so that the image can’t slip. I got lucky and had this cool wood block frame, but I think I’d still try this same idea over a glass frame. Why not? If you like a more crisp look and have the time to get it printed (or you can print photos on your printer), click the download button below to open a zip file containing a 4×6 jpg version of the printable. Thanks for stopping by today. Enjoy your printable! 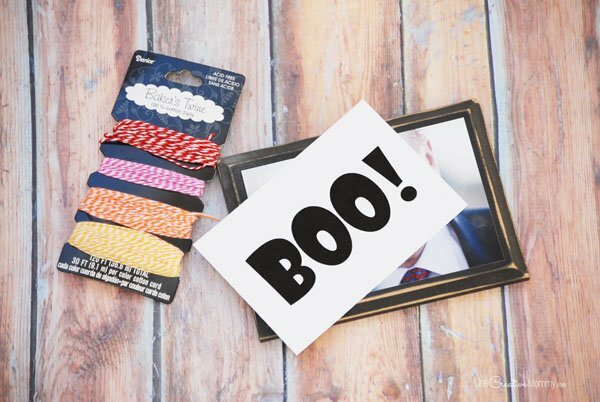 Looking for more last-minute Halloween printables? Check out more ideas below. The images are linked to the posts, so click on them to visit. These are great ideas to decorate on a budget for Halloween. And also thanks for the other printable activities. I’m going to use some for my son’s class party! You’re welcome, Ashley. I hope your son’s class party went well! Thanks for commenting, Lavanda. I agree that printables are a great way to decorate on a dime. Super cute! My kids love to decorate and they would love to make this! Thanks, Sam. This project is definitely easy enough for kids. I love the DIY tip! It’s a great decoration for halloween. Will try this on weekends. Thanks, Emman. I hope you had a fun Halloween. 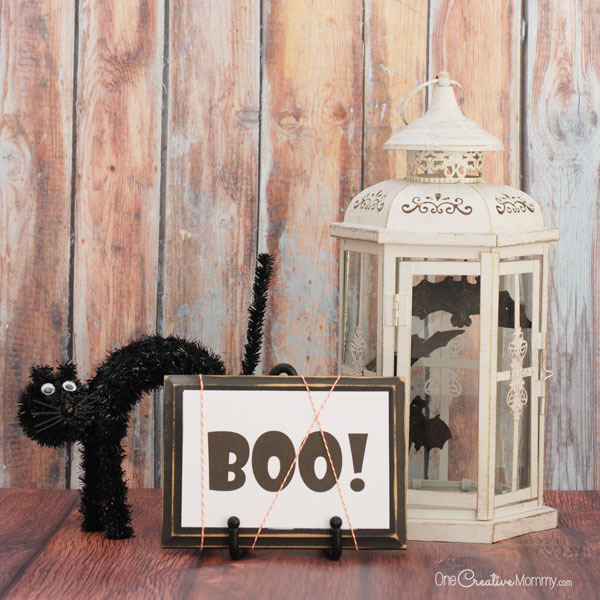 This is so cute, what a fab thing to do for a Halloween decoration, I may have to give it a try myself. these are such amazing ideas! i love how easy they look too. and they could totally be re-used again next year, so i like that aspect too. Thanks, Dawn. Yep. 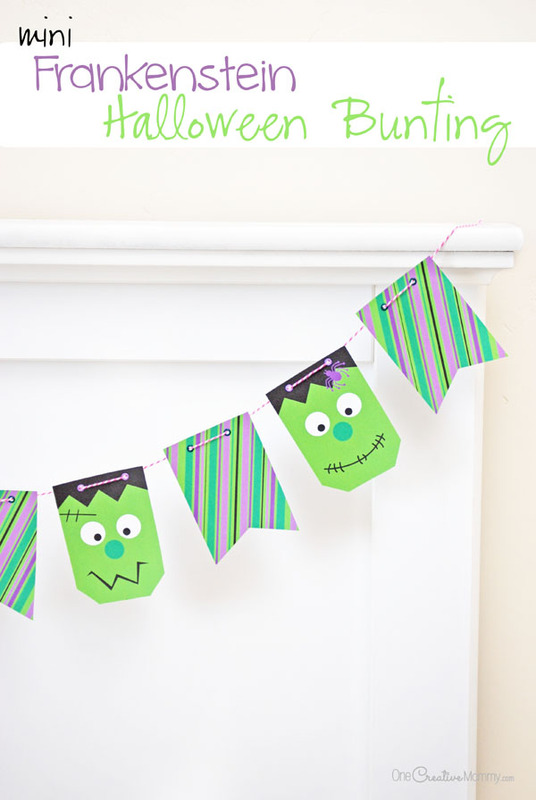 I just throw the printables in with my other Halloween decor and use it again and again. These are so awesome. I love these ideas. I love that you can re-use them the next year too. Thanks, Ginger Mommy. I hope you had a great Halloween. Thanks for commenting. Thanks for the tips, I love all your Halloween DIY ideas. It looks simple but cute and it’s easy to make too. Thanks for taking the time to comment, Angela. I hope you had a great Halloween. The twine around the boo sign is perfect. It gives it that extra punch. I love it! Thanks, Christia. I hope you had a great Halloween. Thanks, Aishwarya. We did have a great Halloween. How about you? Thanks, Blair. Enjoy the printables. I hope you had a great Halloween. I wish I had these when I was in charge of decorating our office for Halloween. I’ve searched everywhere online for decent printables so that I have some nice things to decorate the walls with. You can always save them for next year, Joanna. Thanks for stopping by! Thanks, April. I hope you had a nice Halloween. Looks like you might be able to drag out the Christmas decorations now. 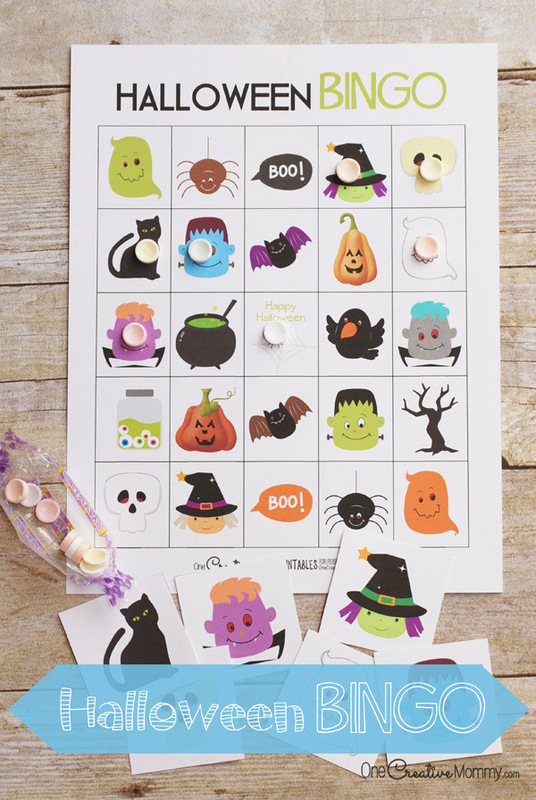 These printables are so adorable! I love that they are so simple. Thanks, TColeman! I hope you had a great Halloween. 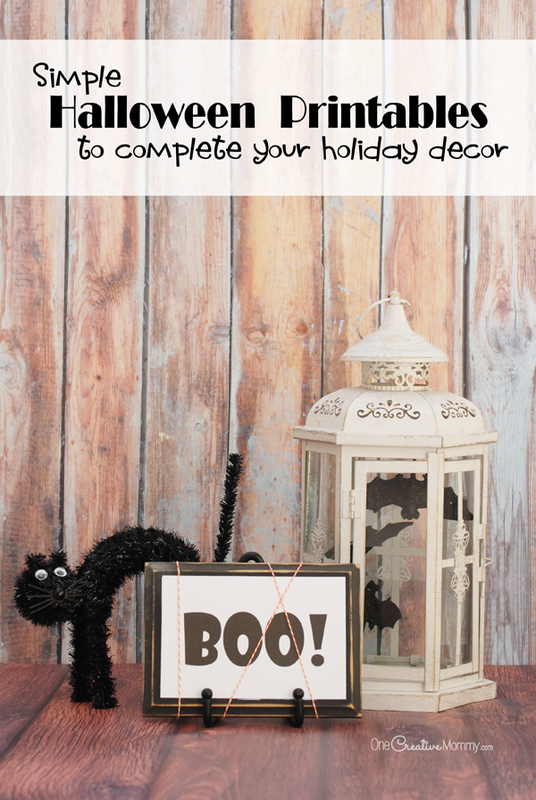 You have some of the most festive printable. This is awesome I love this for decor. Thanks, Kiwi. I love decorating for the holidays. I’m glad you like the printables. What a fabulous printable. I need to print one out for tomorrow. I really like how it came out. Thanks, Amber. I hope you and your family had a fantastic Halloween! Thanks, G&D Blog. 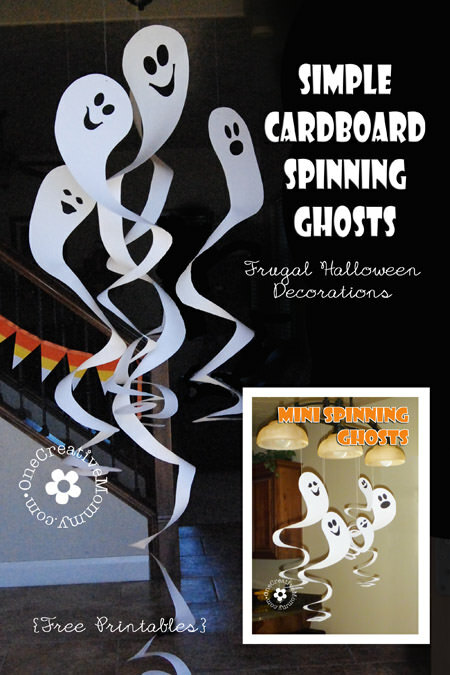 Those spinning ghosts are some of our favorite decorations every year. Thanks, Mayuri. I love easy decorations. I hope you had a great Halloween. These are really great ideas, especially when you’re on a budget! You really made it look like something that you could have bought at any store. I’ll have to try this out for the holidays too, thanks for sharing! Thanks, Nicole. I hate spending money, so I’m always on the lookout for inexpensive ideas. Thanks for sharing these splendid Halloween Ideas, This year I’ll utilize these ideas for sure. I love this idea! I have a lantern I bring out for Christmas and I think I’ll give this idea a try for Halloween!